The old generating buildings once belched smoke and oily fumes from the gas conversion plant that turned coal into a sort of town gas for a 36hp National gas engine that powered a direct current generator. 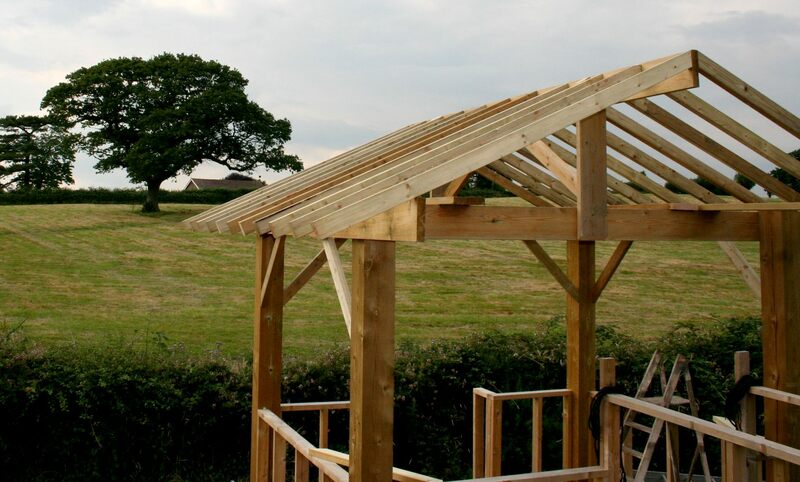 This pergola is actually the mount for a bank of solar panels that will generate clean electricity for the generating buildings, along with water heaters and a wind turbine, going some way down the road, if not all the way, to self-sufficiency in energy terms. The problem with all such projects is integrating the design into the country setting, and in this case the industrial nature of the generating buildings that are the jewels in the archaeological crown. Mostly, improvements to a home or other building that is designed to reduce energy consumption is a permitted development under the 2015 Order, even if this statute does not go far enough to have any real impact. We also need other incentives, for example, to encourage people to drive electric cars and to have solar paneled garages. SOLAR PERGOLA - Untreated the pergola is borderline stand-out, but once stained dark brown it all but disappears to complement the main buildings and add to the rural scene. Once the solar panels are fitted it will look like another small roof and fit right in. The store on the right has all but vanished using the same treatment with the trees being the prominent features. 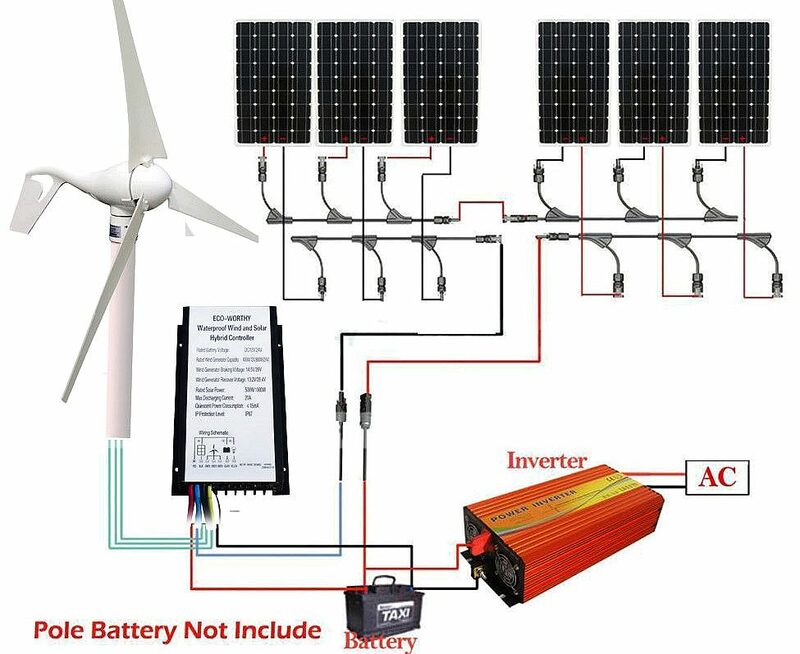 SOLAR & WIND KITS - These home charging kits are very affordable on Ebay or Amazon. We are using two kits to charge four Lucas gel batteries at the moment. We may increase the storage capacity in time to eight batteries and 10kW/hours, where if you do not discharge the batteries below 50% they last a whole lot longer than the rated 500 discharge cycles. 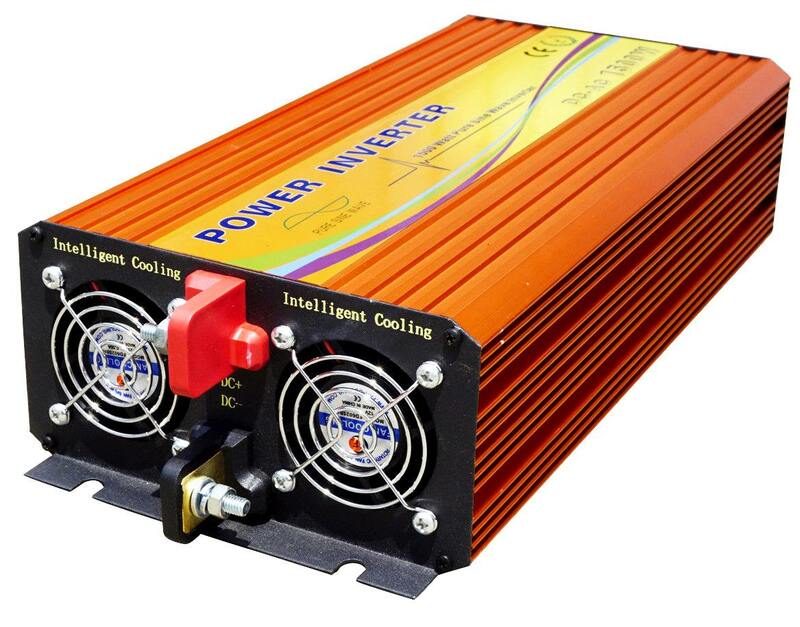 Otherwise the cost of batteries would outweigh the advantages of off-grid charging, save that you can use the electricity as it is generated with the batteries as a buffer. National Planning Policies encourage home owners to fit wind and solar micro generation equipment and solar water heaters. 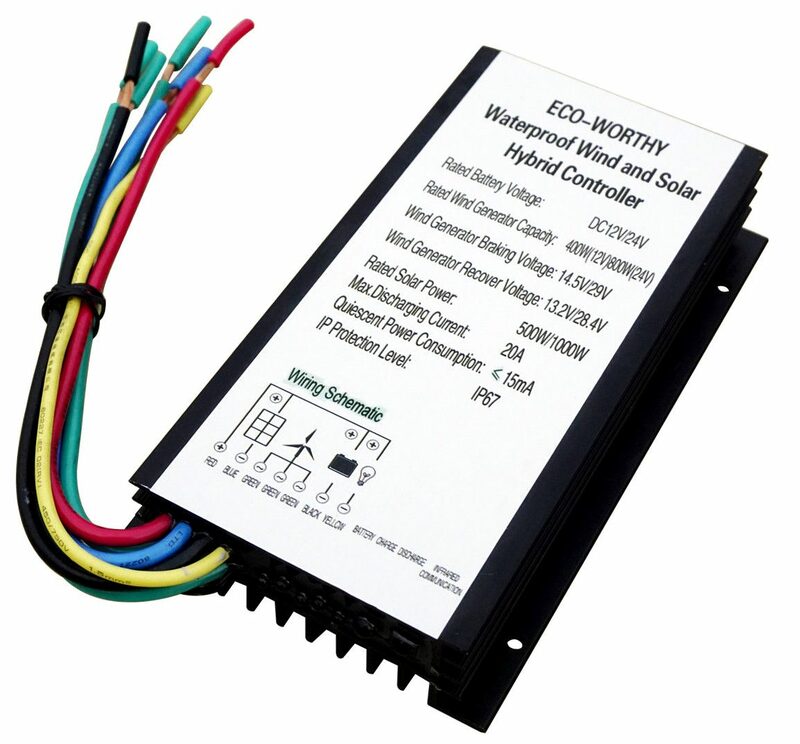 CONTROL ELECTRONICS - We will be using twelve 150 watt solar panels and one 1,500 watt wind turbine to generate 3.3 kilowatts peak, in reality, more like 1.75kW for around eight hours a day. This means that we should have 14kW of clean energy a day to add to our heat collectors, where heat is the one thing that should not be generated by PV panels or wind turbines, unless they are much larger in capacity. Fourteen kilowatts a day is more than is needed to run a home, with energy to spare for some home experimenting on the side, or charging of an electric car. ALMOST INVISIBLE - Romanesque garden setting in Sussex blends in rather well to the surroundings. Note how the untreated overhead timbers draw attention, whereas the stained timbers do not and are all but invisible - and will be once ivy and other flora have their say. Copyright © photograph 24 November 2017. You will need the permission of the Tree Protection Trust to use this picture. Have you ever wondered just how much oxygen one tree makes? Well, one acre of trees annually consumes the amount of carbon dioxide equivalent to that produced by driving an average car for 26,000 miles. According to the New York Times, that same acre of trees also produces enough oxygen for 18 people to breathe for a year. Northwest Territories Forest Management say that a 100-ft tree, 18" diameter at its base, produces 6,000 pounds of oxygen. On average, one tree produces nearly 260 pounds of oxygen each year. Two mature trees can provide enough oxygen for a family of four according to Environment Canada, Canada's national environmental agency. According to a U.S. Forest Service and International Society of Arboriculture joint publication, the mean net annual oxygen production (after accounting for decomposition) per hectare of trees (100% tree canopy) offsets oxygen consumption of 19 people per year (eight people per acre of tree cover), but ranges from nine people per hectare of canopy cover (four people/ac cover) in Minneapolis, Minnesota, to 28 people/ha cover (12 people/ac cover) in Calgary, Alberta. Now that is air to breathe while you think about it - or food for thought. 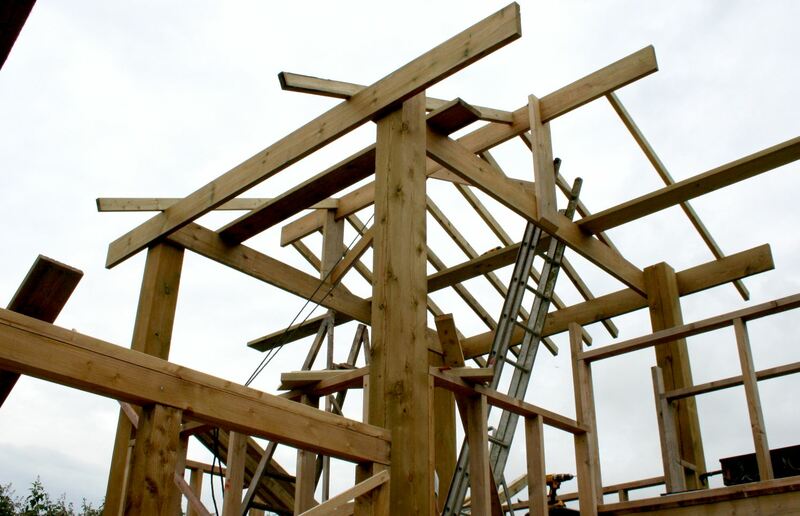 HEY HO AND UP SHE RISES - A structure like this is comparatively quick to erect with a couple of chaps working together it took just two days. Copyright © photograph 2017. You will need the permission of the Tree Protection Trust to use this picture. All rights reserved. SOLAR PANEL SUPPORT FRAME - The basic structure is seen here in the rough, ready to be treated to blend in with the generating buildings, so must be stained a darker brown. Then, the solar panels can be mounted. All kind of data can be gathered from this installation for other applications. Copyright © photograph 2017. You will need the permission of the Tree Protection Trust to use this picture. All rights reserved.